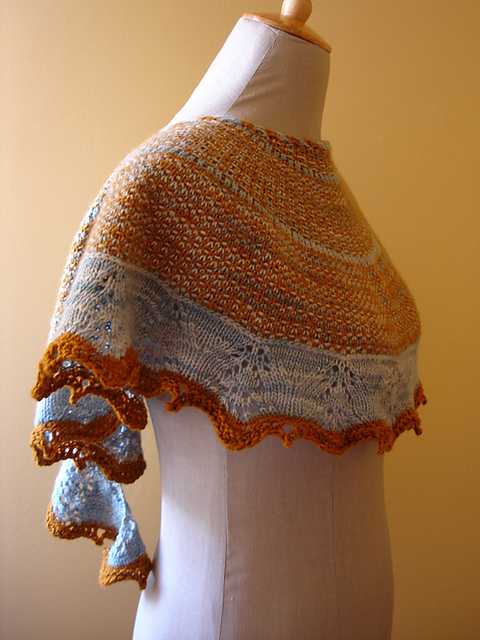 You can find Inês here and here on Ravelry. Everywhere, it changes a lot. My attention might be caught by a pattern stitch, a technique or by a particular shape or concept. I have designs inspired by Nature, poems and music. Something is triggered and I feel the need to explore it until it’s materialized into stitches, resulting in a knitted item. I have many. I especially enjoy combining different techniques and pattern stitches that result in appealing textures. I have, however, a weakness for lace. Its precision and delicacy are both challenging and rewarding. 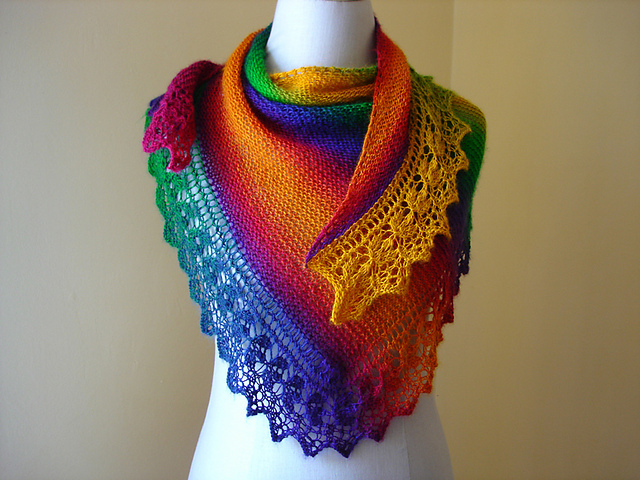 I also prefer seamless projects, which I find polished and clever (more close to the true nature of knitting, in my opinion). When possible I work them in a modular manner, whereby size is adjustable depending of the number of pattern repeats worked. At the present I design accessories and not garments. Most of them are adjustable, being worked in a modular fashion which offers a great deal of freedom to the knitter. I do look and don’t see them as a threat to my own creativity. I enjoy seeing new patterns emerging from magazines, books and great sites such as Ravelry; being aware of the new trends and watching how everything tends to be recycled. What was once old may be now very fashionable. Vintage books and magazines show this very clearly. I believe that patterns should be clear, complete and concise. My approach isn’t throwing knitters into lions' dens by providing scarce instructions and obscure drafts. 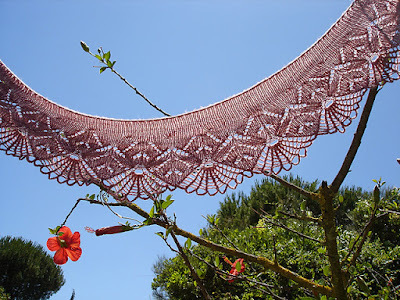 Most of my patterns have both charts and written instructions, and all of them have the abbreviations explained (for instance, I explain how to execute an invisible increase to the right and if the slipped stitches are worked with yarn in front or back). It’s common to provide links to videos, and sometimes I post tutorials showing a special stitch or technique. I think that all these reduce the number of messages inquiring about the pattern. After all, if you have doubts about a sentence, you may check the chart to make sure you’re on the right track. However, every designer has to draw a line and this is very subjective – does it make sense doing a video about an ordinary cast-on just because you’re asked to? Well, the knitter may simply search it on-line and get the answer in a minute. Even though many techniques and new skills may be achieved by knitting more challenging patterns, it’s not reasonable to expect that a designer has to teach how to knit. I spend a great deal of time listing the necessary skills required to knit the pattern and also rate the level (Beginner, Intermediate, or Advanced). Every knitter should take these aspects into consideration before starting to knit the pattern, to avoid frustration and false expectations. 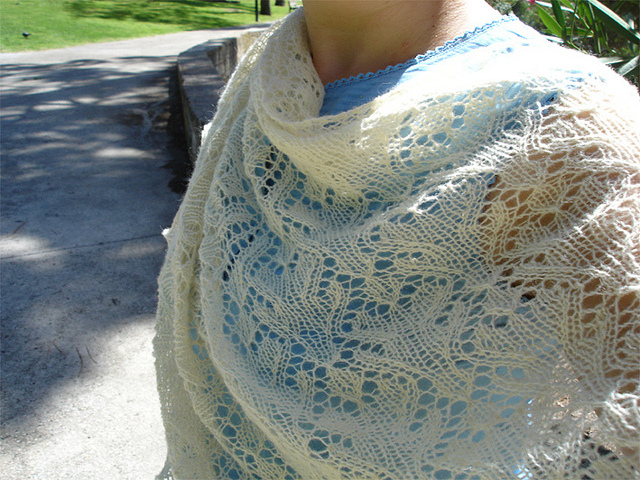 I don’t work with sample knitters – I do it myself. I don’t have specific test knitters; I run test-knits in my Ravelry group and have worked so far with many knitters, many of whom are recurrent. I don’t do lists, which I’m aware is unusual, but this approach has worked well so far. Sometimes, I ask some repeating testers about future tests, especially when they’re done privately. No, I follow a working ethic only – doing the best possible job, over and over again. 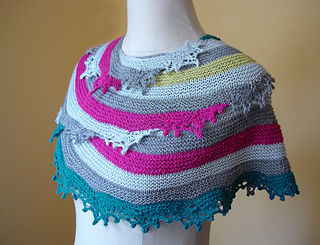 My focus is on publishing high-quality patterns that I feel are special and unusual. I try not to repeat myself. I’m not present on most of the social media either – Twitter, Facebook, etc. Ravelry is an exception. No, I’m a self-taught knitter. I started knitting as a child but my knitting skills were quite basic. I only knew how to cast-on and purl (that’s the dominant stitch in the Portuguese style of knitting). I learned everything else from books, videos, tutorials, etc… One big reference is Barbara G. Walker who is known for one of my favourite techniques – knitting top-down, seamless. When I started, the lack of yarn stores, workshops, knitting groups, etc... was very discouraging. I remember ordering yarn on-line and pretty basic tools such as double pointed needles, which I couldn't find locally. Fortunately, today, the scenario is totally different and knitters have a wide range of tools/choices available. No, unless the pattern is published by a third party. My work is highly tested, first by me and then by test knitters and at the present, this works for me. That's a work in progress. I try to stop working after long hours, otherwise I know I won't function the next day. Because I have a full time job, there is the temptation to spend all my spare time in knitting - nights, weekends, lunch time, etc... However, I think that having a plan and sticking to the plan is a better idea, since I have to attend to other areas and eventually get some rest. Yoga practice is especially helpful to gain some awareness about this issue and create space for myself. I don't see creative work as a sprint but more as an endurance exercise. As with everything in life, we should keep what’s important and ignore what isn’t. One type is constructive feedback that helps to improve our work (correct typos, explain a technique better, fix errors, change the pattern layout, etc…) and another thing is the writing style and even the personal taste, which is much more subjective. Plus, we can’t please everyone; we really can’t. Understanding that a criticism isn’t a personal attack – the subject of the criticism is the work itself and sometimes not even the entire work, but minor aspects of it – might help us deal with criticism in a better way. Patience and persistence. Follow your own path. I'm writing a book focused both on knitting techniques and patterns. At the moment it feels overwhelming, but let's see how it goes. I would like to coordinate this with self-publishing patterns. 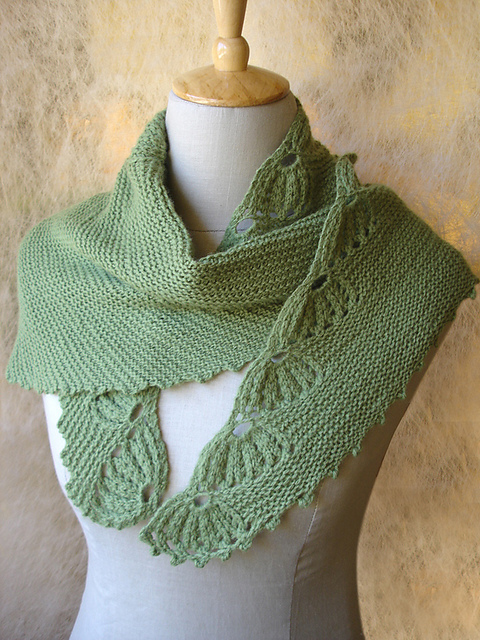 Yesterday, I released Tulipa Espiral on Ravelry and I would like to keep doing that, despite my best efforts being directed into a bigger project.